The Engine of Oracles | Daniel James Hanley's Creations For Gaming. Home of the Ghastly Affair RPG. Yesterday’s Official Rule Changes OFFICIALLY Rescinded! I woke this morning to find that somebody had made supposedly official changes to the Ghastly Affair rules. I have no memory of making any such alterations. I do remember finding the door behind the plaster in my wine cellar, following the passage beyond to my grandfather’s long-lost laboratory, and accidentally breaking a stoppered flask filled with some unknown vapor. The next thing I remember after that is waking this morning in bed, with torn clothes and mud-entrusted shoes. Anyway, any supposedly official rules changes are hereby officially rescinded. Now, I need to investigate the unsettling reports of a short, brutish fellow seen prowling in the vicinity of the townhouse just last night. A similar person was also apparently seen keeping company with the criminal class in the most disreputable part of the city. I believe, however, that the two people are unconnected. OFFICIAL Rules Changes for the Ghastly Affair RPG! Its no secret that Ghastly Affair is the biggest game in the world right now. Frankly, I feel bad for everyone else, who can only stand by in awe as Ghastly Affair continues to consume the entirety of the RPG market. Anyway, the following official rules changes must be implemented immediately by all Presenters. I’ll know if you don’t! All Vampyre characters must speak with a Transylvanian accent. A model for the proper pronunciation can be found here. All characters now have a characteristic called “Manliness”, rated from 0 to 20. It provides an equivalent Bonus to all Ability Checks and weapon damage. Obviously, chick characters can only have a 0 “Manliness”, unless they’re, like, completely weird or something. High Ability scores can now be purchased from the Presenter. For real money. 1 dollar per point above 9. Werewolves must be taken for walks by a responsible person. And given chin scratchies when they are good. All Hit Dice are now changed to d1000. And all weapon damage as well. Don’t forget to add your “Manliness” bonus! All characters must now determine the circumference of all orifices, and note this information on their character sheet. This is IMPORTANT! HOW CAN THERE BE A CREDIBLE GAME WITHOUT EVERYONE KNOWING THE EXACT SIZE OF THEIR ORIFICES? I’M WAITING! All characters now bleed confetti, and all buried skeletons are actually made of candy. Yummy candy. Your PC is now dead. Roll another. I will be the guest of an upcoming Q&A on RANDOM WORLDS chat (hosted at The Hardboiled GMshoe’s Office) March 19th, 2019, from 7:30 PM CST (8:30 EST) to 9:30 PM CST (10:30 EST). If you’d like to know more about Ghastly Affair, or what I’ve got planned for the future, join the conversation at https://tinyurl.com/randomworlds-chat . If you miss the chat, the log will be posted at https://gmshoe.wordpress.com/ afterward. 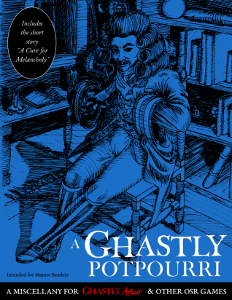 The PDFs of the Ghastly Affair Player’s Manual, the Ghastly Affair Presenter’s Manual, A Ghastly Potpourri, and Highdark Hall, are all currently marked down for DriveThruRPG’s GM’s Day Sale. Hurry, because the sale ends Monday, March 11th. Ghastly Affair was recently discussed in Episode 14 of the “For the Gothic Heroine” podcast, which focused on Gothic gaming. I suggest checking out the other episodes as well! 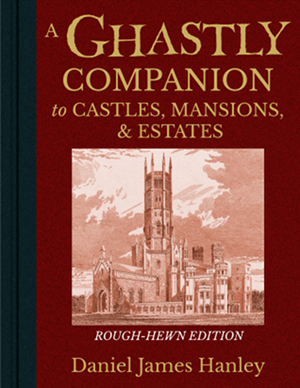 Currently I’m working on a set of “Ghastly Affair Location Catalogues” – form-fillable PDFs that will guide you through the process of creating a massive Grand House using the tables from “A Ghastly Companion to Castle, Mansions & Estates”, while simultaneously creating an organized document that can be easily referenced during game-play. I hope to have those out very soon. If you would like to see a group that’s already experimenting with the possibilities of GROOVY Ghastly Affair, I refer you to the Play@YSDC boards, where Victoria Silverwolf and her Players are running a Play-by-Post game of Ghastly Affair set in Los Angeles during the Swinging Sixties. 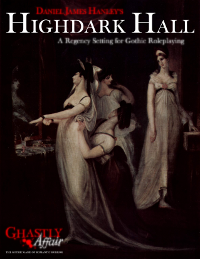 Victoria has also adapted Highdark Hall as the current setting for her main Ghastly Affair game. If you’d like to see an example of how to incorporate the mysterious home of the Altumber family into your game, check it out. That’s the news for today. You can now return to brooding in a cold and shadowy chamber of your moldering family castle, haunted by the memory of a sin for which you can never be forgiven. Or, you could just browse some other blogs. Whichever. One of the biggest inspirations for the idea of GROOVY Ghastly Affair is undoubtedly the original “Dark Shadows” TV show that ran from 1966 to 1971. For many of us who love the show, spotting the frequent on-camera gaffes is part of the fun. Whether it’s a microphone clearly visible in the shot, a coughing cameramen, or even the occasional stage-hand who forgot to leave the set before shooting began, the mistakes add a distinctively charming element to the viewing experience. But to the characters that inhabit that fictional world, the “mistakes” would seem like inexplicably weird events. Thus I present the following table of uncanny in-game occurrences, for Presenters who would like to pay homage to the original Gothic soap opera, and introduce an element of “meta” strangeness into their games. To avoid ruining the effect through over-use, the Presenter should introduce only a single Uncanny Occurrence into each Game Session – although, of course, a typical episode of the inspirational material might actually feature several obvious blunders! I think it’s best to play it all completely straight – the Presenter should simply state the Uncanny Occurrence as casually as possible, and actually make no attempt to play up its strangeness. Naturally, NPCs will always seem completely unaware of any Uncanny Occurrence, to the natural bewilderment of the PCs. the PCs hear a coughing sound, coming from no visible place. the PCs hear some kind of muffled conversation occurring, with no obvious source. the PCs hear the sound of crashing metal objects, coming from no place in particular. an NPC starts speaking in a strangely halting manner, as if trying to remember some rehearsed speech. an NPC is introduced (or states their age) as being in their early 20s, but they are clearly (at least) middle-aged. all NPCs insist (and all visible records now state) that the current day is now actually 1 – 20 days later (or earlier) than what the PCs remember. an NPC introduced in a previous Game Session now looks completely different. No NPCs will notice any difference, of course, and will think any PC who does is crazy. an NPC is suddenly dressed in different clothes, despite there being having been no obvious opportunity at which they could have changed. the PCs notice that an NPC looks exactly the same as another one previously introduced. Naturally, nobody but the PCs seems to notice. a supposedly solidly-built structural feature (such as a door or bannister) suddenly wobbles as if made of plywood or pasteboard. a disembodied hand is briefly visible in a PC’s peripheral vision. the PCs notice that, for some reason, everyone is drinking coffee with everything, everywhere they go. Steaks, sandwiches, lobster – everything! Nobody thinks this is odd. the PCs notice that there is no actual view through a window, just a painted cloth on the other side. the PCs are in a bar, diner, or other place with a jukebox, and they notice that the music seems to consist entirely of the same three songs cycling endlessly. a microphone on a pole becomes briefly visible above the heads of the PCs, but quickly disappears. a PC looks through an open doorway, and the space beyond seems to be nothing but sheets of plywood held up with two-by-fours. But in the blink of an eye, the space looks normal. the PCs notice a man wearing a blue t-shirt, either crouched on the ground or relaxing in a chair. Suddenly he gets up, runs through the nearest doorway (or around an obstruction), and completely disappears. the PCs notice shadows cast by no discernible person or object. the PCs briefly see what look like the front end of a camera, which then suddenly disappears. there is a disposable coffee cup (blue, decorated with an ancient Greek amphora, and inscribed with the words “We are happy to serve you”) left in the middle of some incongruous space (such as an elegant drawing room, unopened crypt, etc.). About 120 years before H.P. Lovecraft, Clark Ashton Smith, and Robert E. Howard collaboratively created what has become known as the “Cthulhu Mythos”, Matthew Lewis (author of “The Monk”) and Walter Scott (who went on to write such books as “Ivanhoe” and “Rob Roy”) made an abortive attempt at a shared mythology based off Germanic stories of the elemental Fairy Kings. Snobbish critics have historically tended to downplay, or even completely ignore, Scott’s involvement with Gothic literature, but he contributed poems to Lewis’ popular anthology “Tales of Wonder”. Scott’s “The Fire-King” (which also appears in his collection “Translations and Imitations from German Ballads”) stands as a great and influential contribution to the literature of the weird. Those familiar with 20th century fantasy may no doubt recognize a precursor of Tolkien’s “Balrog” here. The following depiction of the Fire King combines both Scott’s and Lewis’s ideas. A powerful ruler among the Fire Demons, sought out by the bloodthirsty. Initial Impression: An enormous naked man wreathed in flames, exhaling smoke from his mouth and nostrils, and wielding a bloody falcion of blue steel. Fire Kings are the nominal rulers of the Fire Demons that inhabit the upper atmosphere of the Earth. Thankfully for the human race, even the powerful Fire Kings cannot keep the rebellious demons focused on their goals. Otherwise, all life on Earth might have been incinerated long ago. The Fire King’s muscled body is always wreathed in flame, yet (like all Demons) they actually cause the environment around themselves to become colder, rather than warmer. Anyone who actually touches a Fire King, however, will be horrifically burned. A Fire King’s voice roars like an out of control conflagrations, and lightning will flash from his mouth. His eyes glow like white-hot metal, and despite the fire around him, the blade he carries is always covered in liquid blood. Although he lacks apparent wings, he can fly through the air at great speed. A Fire King is also 50% likely to be riding a Dragon when he appears. A Fire King’s Falcion is actually a Demoniac Object inhabited by a Possessor Demon (with 3 Hit Die). Consequentially, the weapon does an addition 3 points of damage whenever it strikes, and can harm any supernatural creature. As is the case with any Demoniac Object, however, the Demon within the blade can be exorcised, or forced to flee with a successful show of Faith. If that happens, the blade will become an ordinary (if oversized) weapon. If the Fire King is destroyed, the Demon within the blade may agree to stay within the weapon and serve a new owner, if the weapon will be often bathed in gore. Although they are Demons, each Fire King is also part of a regional Fairy court consisting of itself, an Earlking, a Cloud King, and a Water King. Together they conspire to inflict pain, suffering, and death upon humanity. The Fire King’s role is to rain burning meteors on the ground, cause the eruptions of volcanoes, and ensure that travelers are misdirected by roving lights. They are opposed in this work of malevolence, however, by the Good Fairies and Angels who watch over the world. Only the most foolish or powerful Magician would dare try to Summon a Fire King. Nonetheless, their total knowledge of all subjects relating to fire, and ability to wreak destruction, can cause the unwise (or daring) to attempt their command. Likewise, Fire Kings have been sought out by desperate warriors, for the Demons are known to lend their Demoniac Falcions to those who wish to commit acts of slaughter. Demonic Characteristics: Fire Kings are immune to all weapons, except those which are made of iron, blessed, or otherwise enchanted. They cannot be harmed by cold, fire, acid, disease, or any Special Ability or Preternatural Effect which targets minds or emotions (except those that specifically target Spirits, of course). They can see perfectly regardless of illumination, are immune to blindness or any other debility caused by extremely bright light, retain the ability to distinguish colors in conditions of total darkness, and do not need time to adjust their eyes to changing light. Fire Kings can speak, write, and understand all languages and forms of communication. Burning Hot to the Touch: A character that deliberately touches a Fire King with their hand (or other body part) will be burned for 1d6 points of Lethal Damage. Sage of Fire: Fire Kings have perfect knowledge of all arts, sciences, and crafts involving fire – metallurgy, glassblowing, blacksmithing, artillery use, etc. They are sometimes Summoned expressly for their knowledge, but preternatural means such as Bind Spirit are usually required to force the Demons to answer truthfully. Summon Fire Demon: Once during any fight a Fire King may Summon a Fire Demon to his aid. The Demon that responds to the Summon will appear the next Round, and can be anywhere from 1 – 8 HD in strength. Vulnerable to Water: Water-based attacks against a Fire King grant the aggressor a +2 Bonus on the Attack Check, and inflict an additional 2 point of Lethal Damage. Holy Water does double normal damage to Fire Kings. Fire Kings must Check Morale whenever they are damaged by water-based attacks. Demonic Weaknesses: Fire Kings are burned by holy water as if it was acid, cannot enter holy ground or touch blessed objects, and are subject to the power of Faith. Like all Demons, they are Vulnerable to Iron, will not voluntarily touch it, and must Check Morale if damaged by it. Additionally, they are repelled by pure crystalline salt. As Spirits, they are susceptible to all Preternatural Effects that target spiritual entities. Strangely, they cause the entire Nearby Area to become discernibly cold rather than hot. A Fire King is willing to give his Falcion to anyone who has murder in their heart, and who will use the weapon to cause suffering and bloodshed. Naturally, the Possessor Demon inhabiting the weapon will will not tolerate any expressions of piety or tenderness on the part of its owner. If the blade’s wielder shows any evidence of deviating from the path of destruction, it will fly from his hands and return to the Fire King (no matter where the demon currently is in the Universe). The Falcion is over five feet long, and requires a normal-sized person to use both hands when using it. Despite its size, the Demon within it causes the weapon to be as light as a feather. * Magic Resistance: 75%, or +7 on Saves vs. Magic. * Immune to all weapons not Magical, Blessed, or Iron. * Perfect vision under all conditions. * Can speak, write, and understand all languages. * Burning Hot: Take 1d6 Damage if deliberately contacted. * Perfect knowledge of all arts and sciences relating to fire. * Summon a Fire Demon of d8 Hit Dice (once per day). * Cannot enter holy ground. * 50% likely to ride a small Red Dragon. Treasure: 50,000 gp value of coins, gems, and magic items, plus its magical Falcion. Challenge: Four characters of at least 10th Level.